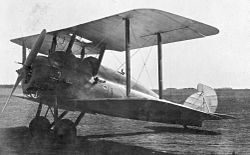 The Parnall Panther was a British carrier based spotter and reconnaissance aircraft designed and developed by Parnall and Sons in the latter years of the First World War. 150 Panthers were built by Bristol Aeroplane Company after the end of the First World War, Parnall having withdrawn from aircraft manufacture, continuing in service until 1926. The Parnall Panther was designed by Harold Bolas, who had joined Parnall and Sons after leaving the Admiralty's Air Department, where he had served as deputy chief designer under Harris Booth . It was planned to meet the requirements of Admiralty Specification N.2A for a two seat reconnaissance aircraft capable of operating from aircraft carriers. 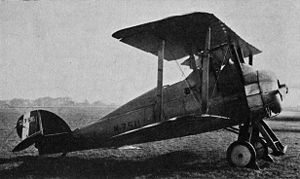 The first prototype, (serial N91) flew in 1917, with a further five prototypes being produced . The Panther was a wooden, single bay biplane, which unusually for the time, was fitted with a birch plywood monocoque fuselage, which could be folded for shipboard storage, the fuselage being hinged aft of the observers cockpit. The pilot and observer were seated in individual cockpits in the deep fuselage, this giving a good view for landing, but restricting access to the pilots cockpit. Inflatable floatation air bags were fitted beneath the wings to keep the aircraft afloat in the event of ditching into the sea, with a hydrovane fitted in front of the undercarriage in order to stop the aircraft nosing over. After evaluation, an order for 300 Panthers was placed with Parnall in 1918. However, this was reduced to 150 following the end of the year. Parnall, who had been purchased by W. & T. Avery Ltd. rejected this reduction in the order, so the order was transferred to the Bristol Aeroplane Company , the order being completed between 1919 and 1920. The Panther served with Spotter Reconnaissance Flights aboard the aircraft carriers HMS Argus and HMS Hermes. While the Panthers handled well in the air, the elderly Bentley engines proved unreliable, while the system of longitudinal arrestor wires in use aboard British aircraft carriers at the time, was unsatisfactory, resulting in many accidents. Panthers continued in service with the Fleet Air Arm until 1926, being replaced by the Fairey IIID. Twelve Panthers were sold to the Imperial Japanese Navy in 1921-22, with two being sold to the US Navy in 1920 .